What kind of classroom routines do you put in place? As the year wraps up, I think it is a critical time to think about classroom expectations and routines that you want to change for next year. It is also a good time to try out a new procedure or routine that you are thinking about for next year. I know its a hard time of year to think about that, but its worth it. If there is a classroom ritual or routine that you have been thinking about implementing, but aren't sure, this can be a good time to try it out. Think of it as a pilot program :). Granted, some things are different at the end of the year than the start, but it gives you a chance to get a feel for what you want to try, and then think about changes that you want to make for the upcoming year. In the past I have changed my homework policy for the last unit or last marking period. I have tried a positive behavior incentive system (it doubles as a good way to keep students motivated at the end of the year). I have also changed how I did the start of class, or the end of class. Here is a starting point for reading about behavior incentive systems. I know they are controversial, and can be problematic, but they can also be helpful. Along with this, another behavior system to try can be classdojo.com. If you haven't heard of classdojo yet, and have a class that is struggling with either behavior or just is not really engaged and motivated, it can be a great tool. You may want to check it out! Both of these systems take some work and adjustment on the teacher's part, so the trial period/pilot program is a great time to see how you like it, and if it will work for you, or what you want to adjust. Another area you may want to experiment with is how you start or end class. It is so important to teach students not to waste time in class, and to come in 'ready to go.' Part of this means being on time, but it also means engaging your brain at the start of class. Whether its a quiz on yesterday's class, an open-ended question to get thinking about today's topic. If you use a timer, it becomes a way to really keep students focused and get on task at the start of class. It is also important to give some students some closure at the end of class, and for both you and they to get a good understanding of their learning and comprehension. I do think through both warm-ups/bell work and exit tickets. Over the years I have done warm ups on a smart board or even an overhead (gasp! ), and had students answer on paper. When I did it that way, a big time saver is this bell work sheet. It will save you time at the copier, and also save time grading, and save class time as students aren't scrambling for paper to write on. If you are thinking about using Google Forms or Google classroom, they are another great way to do warm ups or tickets out. I have created a set of warm-up/tickets out in Google Forms that you could try out. I also have the same set of warm ups in Google Slides and an PDF's, if you prefer to project them, do them on paper. These will eventually be part of a growing bundle of warm ups and tickets out on various topics to use throughout the year (should be posted this weekend). If you are thinking about trying out different seating arrangements, use editable seating templates to get some ideas going. Finally, if what you really want is general tickets out, that are not topic specific, check out this freebie. Tickets out can be used for reflection, formative assessment, or closure on a lesson. These four freebies are part of a larger pack that is NOT subject specific and can be used in so many different ways. If you are looking for a timer, to use for bellwork, I have used several free options. Within the chrome browser is this extension for 1-click timer. If you use the Smartboard you probably already know that there is built in timer. If you are looking for a freestanding time in Windows here is good one. It is 'portable' which means that you don't need to install anything (say on a district computer where you can't install) to use it. 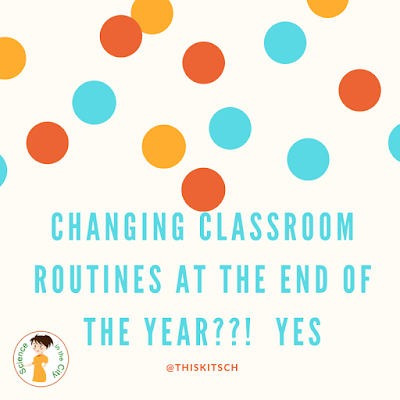 Hope some of these ideas were helpful, and give you a little bit of perspective on your classroom routines at this point in the year. What things are you looking to change or try out? Loved reading your post. I am very fortunate that I get the group of students I received this year for three consecutive years. Keeping routines and procedures tight keeps me sane this time of year.... that being said... I do tweak and test run certain ideas because it will be the same crew next year.